Walker & Company, 9780802717597, 294pp. In the waning days of his presidency, in January 1801, John Adams made some historic appointments to preserve his Federalist legacy. 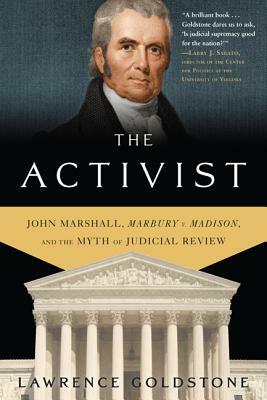 Foremost among them, he named his secretary of state, John Marshall, Chief Justice of the Supreme Court-neither of them anticipating that Marshall would soon need to decide the most crucial case in Supreme Court history-Marbury vs. Madison. The Activist is the story of that case and its impact on American history. It revolved around a suit brought by Federalist William Marbury and 3 others that unwittingly set off a Constitutional debate that has reverberated for more than two centuries, for the case introduced a principle ("judicial review") at the heart of our democracy: does the Supreme Court have the right to interpret the Constitution and the law. Acclaimed narrative historian Larry Goldstone makes this early American legal drama come alive for readers today as a seminal moment in our history, chronicling, as it does, the formation and foundation of the Supreme Court. But it has ever since given cover to justices, like Antonin Scalia today, who assert the Court's power over the meaning of the Constitution.That Marshall's opinion was also the very height of the judicial activism that Scalia, John Roberts, and their fellow conservatives deplore promises to be one of American history's great ironies.The debate began in 1801, and continues to this day-and in Lawrence Goldstone's hands, it has never been more interesting or relevant for general readers. Lawrence Goldstone holds a Ph.D. in American Constitutional Studies, and is the author of several highly praised works of narrative history, including Dark Bargain: Slavery, Profits, and the Struggle for the Constitution; and, with his wife, Nancy, Out of the Flames and The Friar and the Cipher. He is also the author of the novel, The Anatomy of Deception, published in January 2008. He lives in Westport, Connecticut.